First run as an adventurous TSD event in 1967, Nor'Wester has a significant history in the Pacific Northwest. From 1967 until 1972, Nor'Wester was known as one of the foremost TSD rallies in the United States. In 1973, the format changed to a stage event for the new SCCA Pro Rally Series, on closed roads. This was the case through 1984, and Nor'Wester had become part of Rally Week Northwest, with Nor'Wester running one weekend, followed by Olympus the following weekend. Then, with the advent of the WRC events coming to the forests (and streets!) of Washington, Nor'Wester fell off the calendar. Then, in 1996, Jerry Hines (rallymaster of the Alcan 5000 Rally) put forth the idea of running a 30th anniversary event in the original TSD format. The task of duplicating the route of the 1967 three-day rally was handed to Roy Ward. Using the original R.I.s, Roy found "progress" had impacted the course rather significantly. Freeways had been built, new roads intervened, and some roads had disappeared entirely. But with some rerouting, and a little creativity, a route was laid out and measured, and in 1997, the 30th Anniversary Nor'Wester ran from Bellevue, WA to Clarkston, WA, then to Coeur d'Alene, ID. The third day was dropped, since so much of the third day of the original route was no longer followable. But a good time was had by all, so now we have assembled a route that Roy and Ron believe really represents the spirit of the original TSD event. 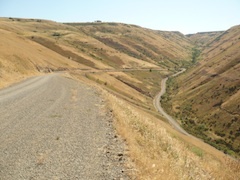 The 2012 Nor'Wester will be a tour of the crunchy bits of Eastern Washington, a smidge of Oregon, and a large part of Central Idaho, with sustained hillclimbs, breathtaking vistas, meandering forest tracks, and a pine cone or two. Starting in the cattle hub of Washington, Ellensburg, the rally pursues the lesser traveled environs through ranches, farms, forests, and vineyards. Stay tuned for more information! Overnight: Red Lion, Lewiston, ID. Finish Location: Pizza by Chico, Moses Lake, WA. Classes: Unlimited, Equipped, Seat-Of-Pants, Vintage, Novice. A hearty ‘Thank You’ to everyone who came out to participate in the 2012 Nor’Wester! The weather cooperated, the wildfires left us alone (although the smoky haze evident almost everywhere we went reminded us that there were fires elsewhere), and the roads were still there. Everyone at the finish seemed to have had a good time, which is, after all, the whole point. 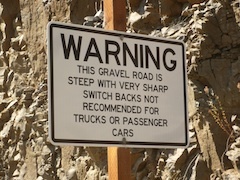 As advertised, there was gravel, switchbacks, and hillclimbs. We also had the opportunity to explore the differences between Washington state washboard and Idaho washboard (Idaho having a more subtle, mature ambience in contrast to the brash, bold, youthful exuberance of Washington’s road ripple). Thanks to our team of amazing and skilled checkpoint workers, and kudos to our Chief of Controls, Steve Perret, whose daunting task of creating the behind-the-scenes sub-rally of moving workers efficiently was handled beautifully. Thanks also to Kathryn Hansen, our tireless scoring expert, who dealt with the multitude of issues that came up in a terrific and professional manor. 63 checkpoints were scored. Hats off! Thanks also to our start, overnight, and finish facilities, The Hampton Inn Ellensburg, the Red Lion Lewiston, and Chico’s Pizza in Moses Lake. Nothing like a flash mob of rallyists to test the hospitality industry. Most of all, I would like to personally acknowledge the real Rallymaster of the 45th Anniversay Nor’Wester, Ron Sorem. His experience, knowledge, patience, and amazing thoroughness is what brought together the dizzying components of a two-day endurance rally. The results of his many hours of hard work were reflected in the smiling faces and enthusiastic stories that filled the room at the finish. Well done, my friend. Well done. Pacific Coast Challenge International Rally Series: Nor'Wester 2012 is proud to serve as Round 3 of the PCC series this year. Your participation and finish position in Nor'Wester earns points in the series. We encourage you to contest all PCC events. Complete information on the series is available at the Pacific Coast Challenge Website.